Los Alamos County Open Space is open to non-motorized use only. Hiking, running, horse travel, and mountain biking are permitted on County trails. Put it anywhere else and it would be a National Park. Carved by the Rio Grande through thick lava flows, White Rock Canyon is a geologic masterpiece that averages 1,000 feet deep. The spectacular vistas, rugged terrain, and perennial streams make this a premier destination for outdoor explorers. More information about White Rock Canyon. Standing in ranks on the lower slopes of Pueblo Canyon, rock sentinels with stone heads and conical bodies keep watch over canyon floor. A creation of an unusual combination of geology, the photogenic rock towers have lured visitors to the canyon for more than a century. Known variously as hoodoos, stone tents, or tent rocks, the formations are found only in a handful of locations around the world. More information about Pueblo Canyon Tent Rocks. Deer Trap Mesa is part of one of the long fingers of rock that extend east from the Sierra de los Valles. The finger mesas are made of volcanic tuff--fused volcanic ash--that erupted from the Valles caldera about a million years ago. The tuff forms colorful cliffs, and creates a gently rolling terrain on the mesa top. Where Deer Trap Mesa pulls away from Barranca Mesa, it is only 20 feet wide. This narrow perch of rock creates fine vistas in all directions. The mesa is named for a game pit found close to the start of the trail. Located in a low saddle in the mesa, the pit was likely used by Ancetral Pueblo hunters to trap mule deer by herding them up the narrow Barrancas Canyon and forcing them over the saddle and into the pit. Nearby are rock stairs cut into the soft tuff and deep trenches worn into the rock by hikers. 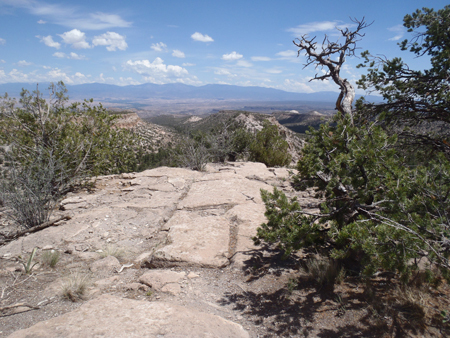 Along the mesa top, the modern trail follows an Ancestral Pueblo trail for almost a mile. The mesa's relative isolation makes it an attractive location for wildlife viewing, for studying wildflowers, and for simply enjoying the view. Walking is easy, except for a short section of rock stairs near the trailhead. The mesa has three points, each of which can be explored on foot. Take a look here for information on hiking Deer Trap Mesa. Three trailheads along West Jemez Road (State Road 501) provide access to the canyons and mesas east of the crest of the Sierra de los Valles. The canyons are deep, narrow and sometimes shady as all were partially burned in the Cerro Grande and Las Conchas fires. Running water is found in stretches of all three, and in summer they support dozens of species of wildflowers. These trails are on the Santa Fe National Forest. Water Canyon drains the east flank of Cerro Grande and has seen more than its share of post-fire flood events over the past two decades. The trail has been rebuilt twice since 2000. The trip to Sawmill Meadow makes a delightful short trip suitable for all ages; the full loop is a great half-day hike and short bike trip. Along the trail you will find shady forests, burned woods, boulder pile-ups from floods, and there is always water in the middle section of the canyon. The constant flow is a result of a mid-1940s water development that supplied Los Alamos National Laboratory. A small dam and other water works can be found in the north tributary drainage just above Sawmill Meadow. 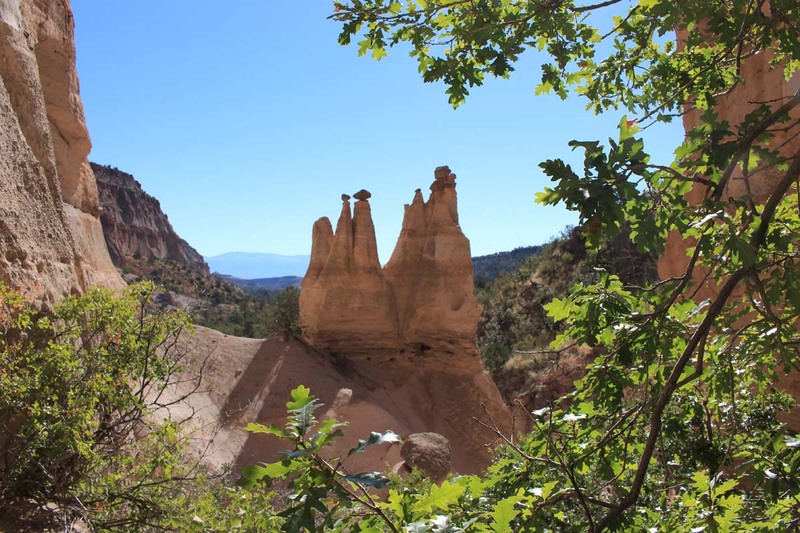 Cañon de Valle is a long, attractive canyon with tall conifers, abundant wildflowers, and running water. The trail up the canyon follows a route that has been used for 150 years, but post-fire floods have force sections of the trail to be rerouted out of the flood zone. The long trail gains more than 1,000 feet as it climbs to the boundary fence of the Valles Caldera National Preserve. The fence is the turnaround point for this trip as access to the Preserve is not permitted from this point. Click here to download a brochure on hiking the West Canyons. Los Alamos County is looking for an experienced and certified contractor for the design and build of a mountain bicycle flow trail. The scope of work to include consultation of existing flagged trail corridor and 3-4 alternatives to include feasibility, safety, and functionality for a “green” level International Mountain Bike Association (IMBA) flow trail. Upon completion of consultation, development of schematic design of seven (7) mile trail with a number and type of features anticipated. Upon approval of design, contractor will begin construction of the trail while instructing County staff to ultimately self-perform trail construction. Staff and consultant to present the options to the PRB subcommittee/s and Tourism Implementation Taskforce to discuss with committee/group and receive public input. Staff and consultant will then will incorporate committee/group/public input and narrow down to the best option. Staff and consultant will then will incorporate board/public input and prepare a presentation to Council to include our recommendation and a schematic design. 7. Staff and consultant will then present the presentation to County Council for a decision. Approved - Staff will conclude the consultation phase and issue a task order for construction. Not Approved – Staff will receive direction for further action or inaction.